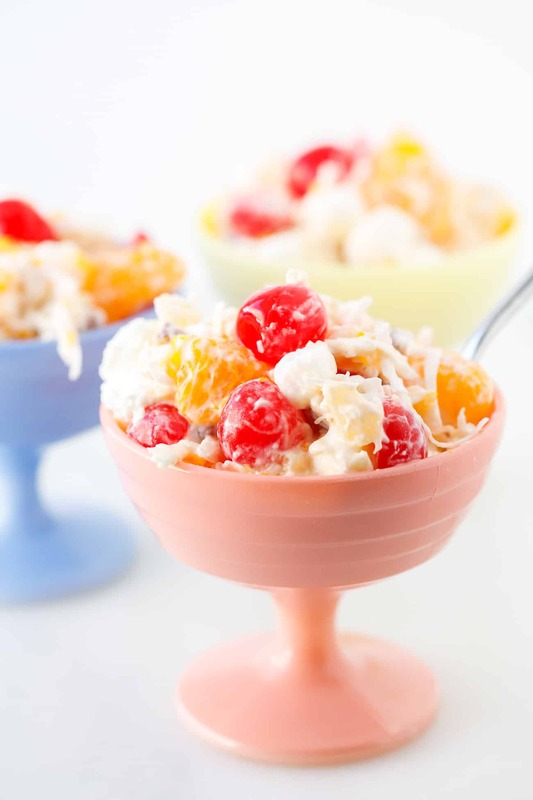 Ambrosia Salad - Grandma's BEST Ambrosia Salad Recipe! 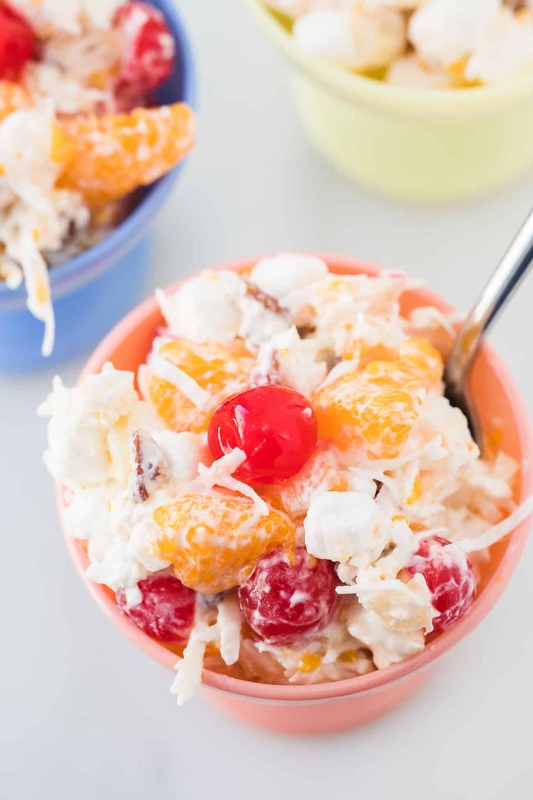 Ambrosia Salad is a classic potluck dessert that your family will absolutely adore! The best part? This ambrosia fruit salad recipe tastes even better the next day! Y’all know how much I adore my old-fashioned potluck recipes! Whether it’s my pistachio fluff, this creamy grape salad, or our amazing broccoli salad, I just LOVE easy recipes that remind me of the dishes that my grandma used to make. This delicious ambrosia salad is no exception. 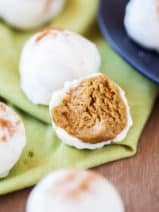 I can remember eating variations on this dish at family gatherings as a kid, and it was a staple at our annual family reunions. 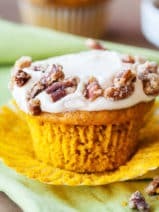 If you love the flavors in this ambrosia salad, don’t miss my ambrosia muffins! One of the things I really like about ambrosia salad is that it isn’t too sweet. 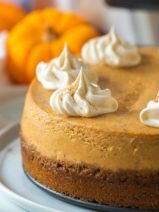 It’s cool, creamy, and delicious with bursts of fruity flavor and a little crunch. Of course, I am a huge fan of coconut in desserts. After all, my favorite dessert of ALL TIME are these to-die-for coconut magic bars. The instructions for making the recipe really couldn’t be any easier. Don’t you love no-brainer recipes? All you need to do is dump all of the prepared items into a biggish bowl, and fold it all together. Speaking of dump-recipes, don’t miss my popular cherry dump cake! 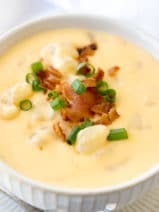 Now, remember, you’re going to want to put your ambrosia salad in the refrigerator to cool for about 4 hours or up to overnight. The recipe really needs this time to reach it’s full, flavorful potential. For this reason, I like mixing my ambrosia salad in a bowl with a lid. These mixing bowls with lids are fantastic if you’re shopping for a set! 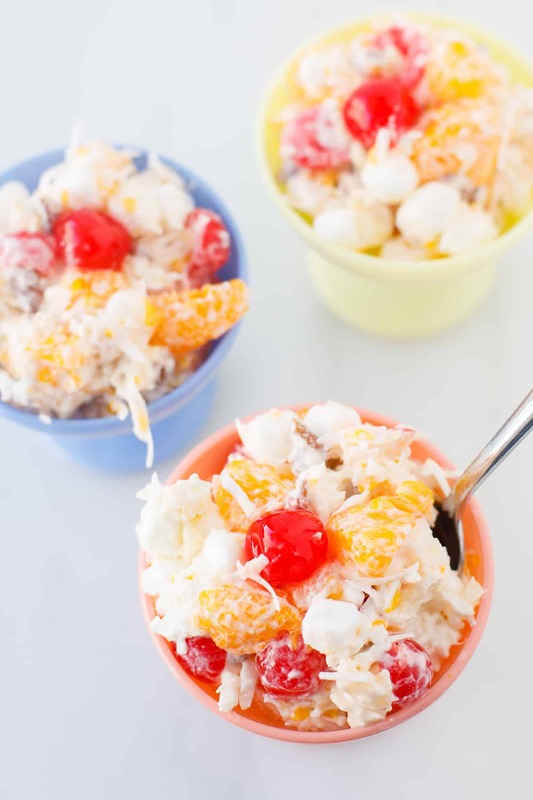 Here’s a fun twist on our classic ambrosia salad recipe. Instead of using mandarin oranges and maraschino cherries, you can actually just use a can of fruit cocktail. This twist will add even more color and flavor to your ambrosia salad. My kids really love this recipe when I make it using the fruit cocktail! My kids have an obsession with maraschino cherries, so even if I make this recipe using the can of fruit cocktail I always add extra cherries for them. Don’t like nuts? Just leave them out. My ambrosia salad with Cool Whip doesn’t suffer at all without them. Versatility is really one of the things that I love most about old family recipes like this yummy ambrosia salad. You can easily swap ingredients to suit your family’s preferences! Have you ever made this classic ambrosia salad before? 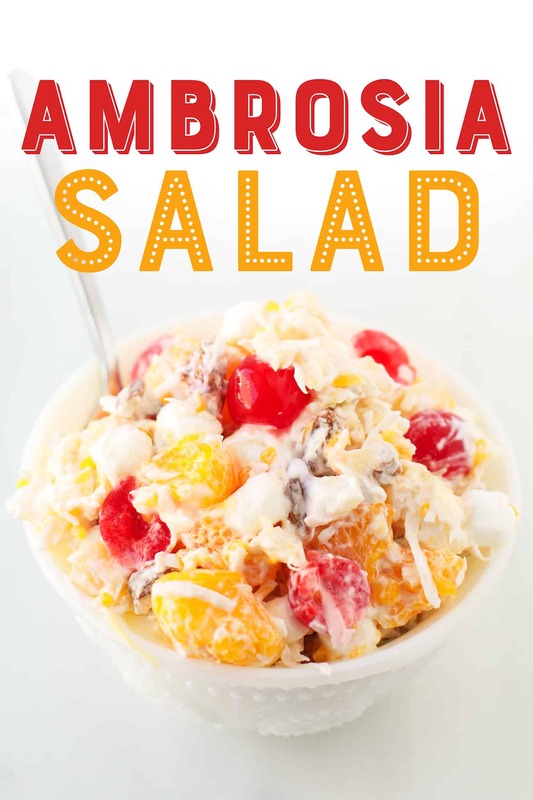 I’d love to hear how you fix your ambrosia salad recipe in the comments below. I always learn so much from you guys! 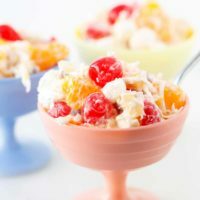 Cool, creamy, and delicious, this ambrosia salad recipe is always a hit with family and friends. In a large bowl stir together all ingredients. Refrigerate 4-6 hours or overnight. Thank you for the recipe! This stuff is wonderful! My family does not like the cherries, so instead I put in grapes 🍇 and small apple 🍎 chunks. It tastes great! Everyone at family gatherings loves it! I love Ambrosia! 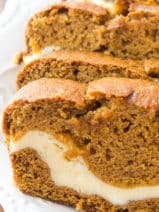 My grandmother made it for every get-together, but I haven’t had any in years….adding to my grocery list now. Thanks for bringing back great memories!